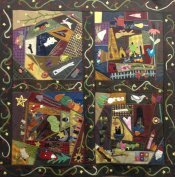 This engaging crazy quilt has lots of folksy wool appliques and embroidery stitiches with primitive flannel backgrounds. 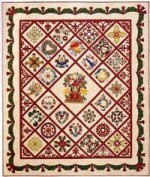 The pattern book contains many examples of the 'crazy stitches' you can add to your quilt and contains templates for the wool appliques. The project finishes approximately 60" square. Do you need to de-stash your stash so you can re-stash? Need to reenergize your projects? 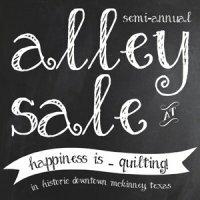 Join us for the Alley Sale! If you're a bargain shopper, this is the place to score those bargain deals. There are only a few spots left if you are planning to sell your quilting related goodies. Get your spot today and mark your calendars. Join Betsy Chutchian on Friday, Oct. 4, and/or Saturday, Oct. 5, for her Sewjourn Retreat here at the shop. 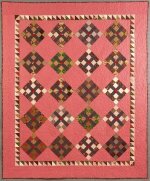 We will be working on two different quilts from her latest book, Lizzie's Legacy. Friday we'll work on the "Lounge Quilt" and Saturday we'll stitch "Twist and Shout." If you're a HIQ Diva, this is "the original Diva." Calling all aspiring ladies of Baltimore! This is the real deal; finally your chance to take the plunge and learn to make all those incredible blocks you've been drooling over. Join us for a Baltimore Album Quilt Journey led by international applique teacher and designer Kathy Dunigan. This quilt is featured in Elly Sienkiewicz's latest book, Beloved Baltimore Album Quilts, and was unveiled at Houston Quilt Festival 2010. 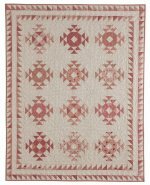 Let Kathy teach you the "behind the scenes" tips and wonders of what makes these "Baltimore Album Quilts" so valuable and desirable. She'll share a lot of history regarding these blocks each month. This Baltimore journey begins Saturday, Sept. 28! Enroll here.